But cola has been secretly (?) used in many modern interpretation of traditional Korean meat/poultry dishes. Well…, it is not much of secret anymore, though. Many home cooks in Korea sneak in leftover cola that has been fizzed out into their beef/pork/chicken dinner and the result? 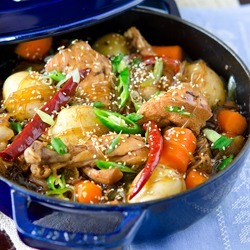 An outstanding meal ready in one pot. 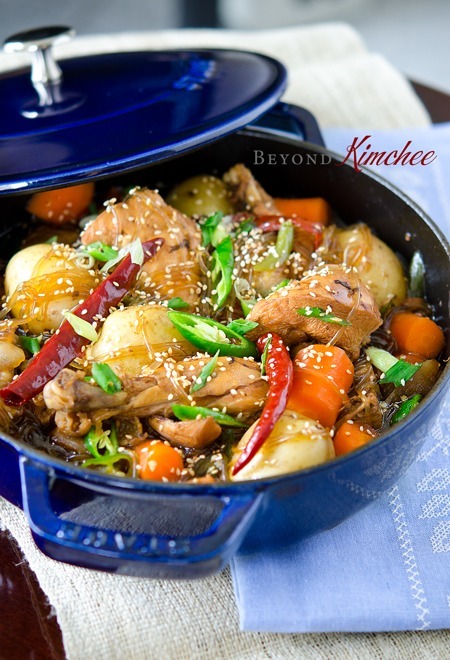 This Cola Braised Korean Chicken (콜라 찜닭, cola jjimdak) is very easy to make. So easy that even a novice to the Korean cooking can whip this up with ‘fan-ta-bulous’ (fantastic + fabulous) result. And you won’t even taste the licorice flavor of cola but leave with the flavor that soy sauce alone can’t create. Hard to imagine? Don’t skip on the noodles. It soaks up all the good flavor of sauce and you will love the charming sounds of slurping this clear Korean sweet potato noodles, aka dangmyeon. Now, go and have your chicken man to cut up a whole chicken into pieces for you. If you don’t have a friendly chicken man to cut a whole chicken for you, use any combination chicken parts you like, boned-in pieces, pease! 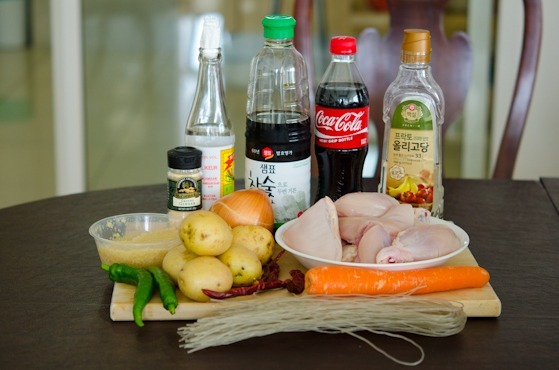 Here are the ingredients you need; soy sauce, cola (coke), rice wine, Korean corn syrup (optional, I ended up not using it), garlic, ginger, chilies, potatoes, carrots, onion, sweet potato noodles and chicken, of course. I trimmed the skin from the chicken pieces only because I am not a huge fan of skin. You don’t need to if you don’t care about it. First, soak the Korean sweet potato noodles (dangmyeon) in the warm water until ready to go. Set aside. Bring a pot of water to boil. Add the chicken and let the water to come up to boil again. Turn off the heat and remove the chicken from their hot bubble bath. Here they are. Nice and clean. Why do I pre-boil the chicken? 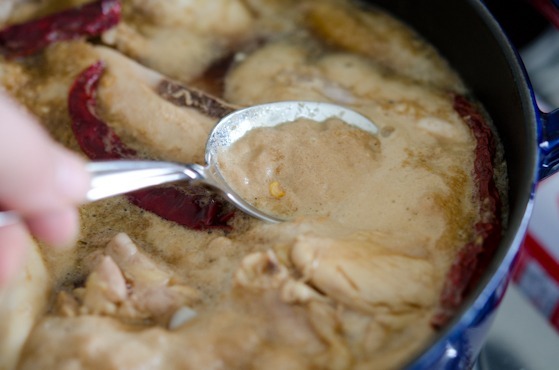 To get rid of some gunk and to reduce the gamy poultry smell in the sauce. They are basically just blanched. Now, grab a braising pot. Pour your coke. Add soy sauce, rice wine, garlic, and ginger (either fresh or powdered). Mix well. Add the chicken pieces and chilies. I used dried chilies. Dried chilies are great to use in braising and they tend to bring spicier kick to the dish. You can use fresh chilies if you can’t find the dried kind. I only used 4. Feel free to increase the number of chillies if you want the spicy stimulation on your tongue. Bring the chicken to boil. You will see some scums floating. 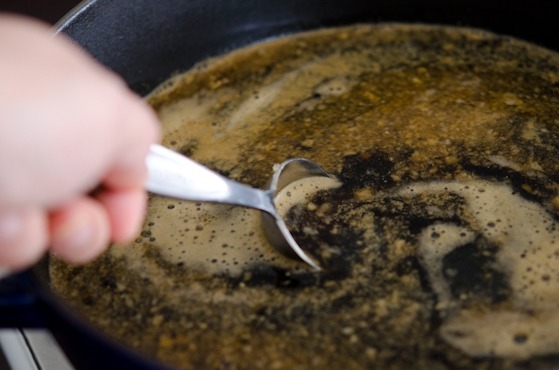 If you want your sauce to be clean and clear, scoop it out with a spoon as much as you can. Add your vegetables chunks. I left my potato in whole since they are small. Don’t cut your vegetable too small. 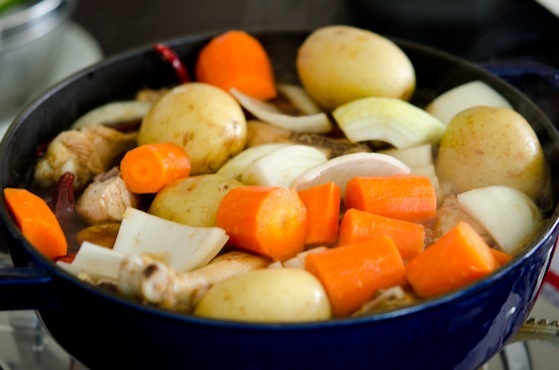 You need to adjust your braising time or when to add the vegetables depends on the size of your vegies. Cover with a lid and simmer over med-low heat for 20 minutes. The meat and the vegetables are almost fork tender. Add the soaked noodles and green chilies (if you like). Continue to braise, UNCOVERED, stirring once or twice, about 5-7 minutes over medium heat. When you see the sauce gets reduced and the noodles are soft, it is done. Let everything to rest for a few minutes so the liquid will soak through the noodles and to all the other yummy stuff in the pot. You don’t need any fancy side dishes to go with. 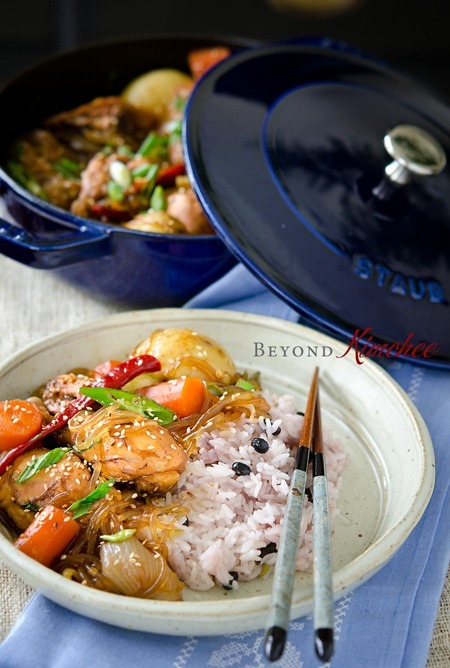 It is a great Korean style one pot meal on its own but I serve myself with a little rice to soak up all the good juice, though. Who knew the very *American* soft drink can cast their magic to make Korean chicken so flavorful? I gotta think of something Korean to make American chicken proud in return. Any ideas? 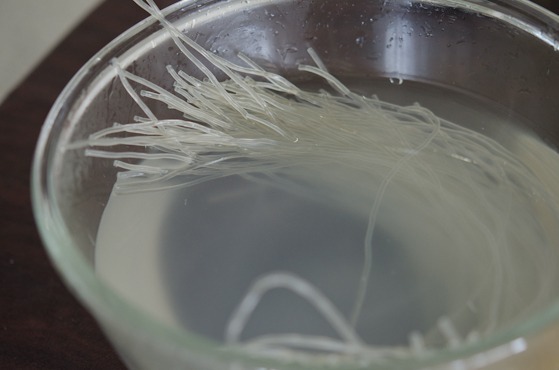 Soak the Korean sweet potato noodles in warm water to soften. Set aside. Bring water to boil in a medium pot. Add the chicken pieces and let the water come up to boil again. Remove the chicken from water. Set aside. 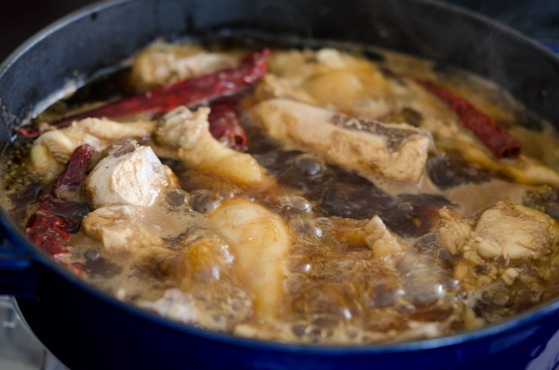 In a braising pot combiner Coke, soy sauce, rice wine, garlic, ginger together. 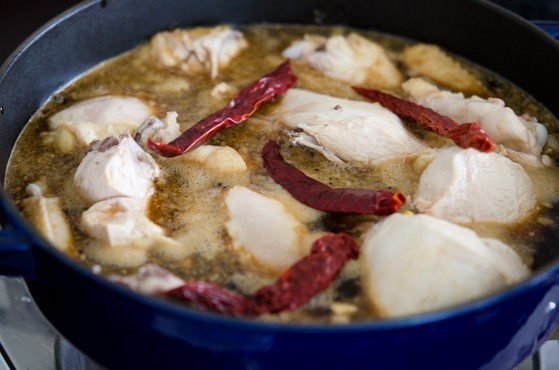 Return the chicken to the mixture and add the dried chillies. Bring to boil. If you see any scums on the surface, scoop out with a spoon to get the clear sauce. 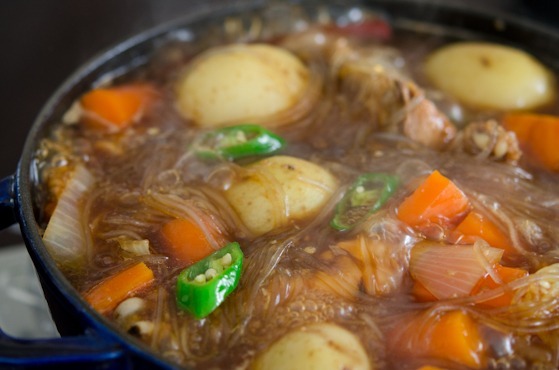 When the whole thing comes to boil, add the potatoes, carrots and onions to the pot, and stir to coat evenly. Cover with a lid and simmer over medium-low heat for 20 minutes. Raise heat to medium or medium-high, add the noodles and continue to cook for another 5-7 minutes, uncovered, stirring once or twice. When you see your sauce gets reduced by half and the vegetables are tender, it is done. 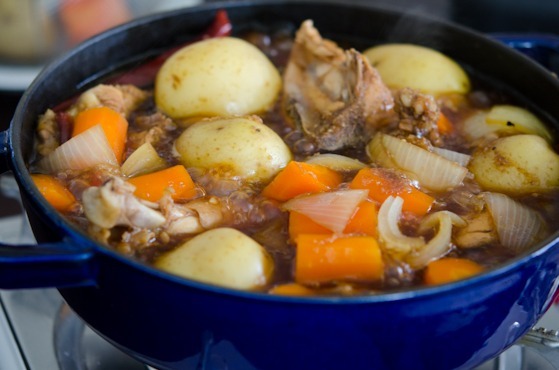 Let the stew rest for a few minutes before serving so the flavor will settle into everything in the pot. Serve warm with a little rice. Wow, what an amazing secret ingredient! 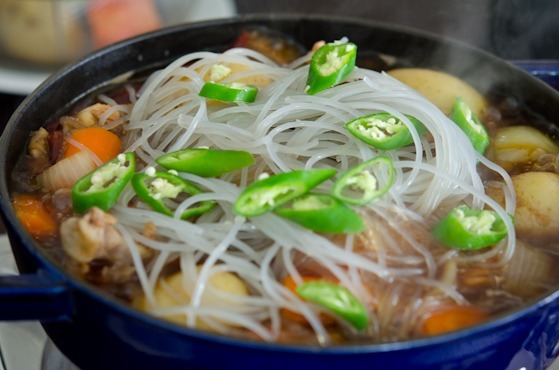 With the chili and potato noodles, this sounds perfect for a chilly (finally!) evening. What a cool recipe! I've seen recipes that have specified cola in them, but most of those sounded a little weird. This one, though, seems just right. Nice flavors, and I love the inclusion of the noodles. Great pictures, as always. Really good stuff - thanks. Yum! This looks delicious, and I think it would be great for a quick weeknight dinner. Your photos are beautiful, and I'd love to have a bite of this chicken right now! Amazing! I never would've thought to add cola but it seems like such a wonderful combination. And your staub is such a gorgeous blue! As always, great recipe, Holly. Very flavorful! Very delicious! Thanks. What a gorgeous dish! I especially love that it comes together in all but 5 minutes! Thanks for pointing that out, Nelly. You just found how clumsy I am. :) I fixed it. This look so good, I love your step by step instructions. Perfect for the cooler weather to come. I have some Korean sweet potato noodles in my pantry already! Yum! I have a lot of Korean products because our Asian store owners are Korean so we get exposed to a lot of ingredients that they use and recommend. The Korean sesame oil is the best! I used fresh red jalapenos from the end of the year garden...the spiciness was just perfect, the chicken was falling off the bones....Yum! I wonder if I could try this with chicken breast or boneless thighs? 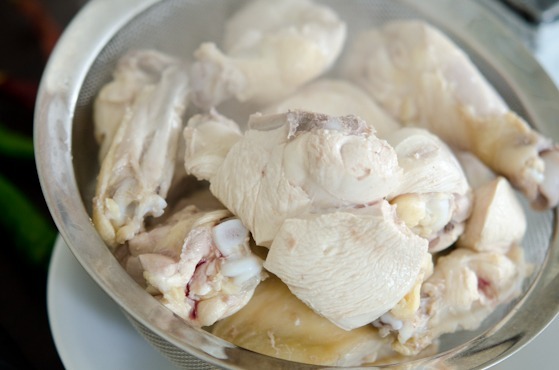 Yes, you can but chicken with bones will offer better flavor especially with braising method. This recipe was consumed last night by a houseful of picky eaters with no comment whatsoever. It is one of the quietest dinners we have ever eaten. Everyone was so busy eating this delicious stew that no one thought to talk. Great! So happy to hear that. Thanks for your comment, Tamar! Holly, your blog has changed my life- & my kitchen! I am making this dish tomorrow for my family on Xmas eve in italy. All the recipes I have tried from you have been marvellous, so I'm confident this will be a great treat as well! Thanks so much - & happy holidays! Thanks Micol. Hope your family will like the stew. Merry Christmas to you, too. OMG, this is an AWESOME recipe! My mom is from Seoul but she had a stroke before she could give me all her recipes. This reminds me sooo much of a dish she used to make for me when I was growing up! Your site has so many of her recipes (I know, I know, Korean, duhh....but still, so happy to find recipes that taste like my moms!). I made this tonite for my wife and I and it was FANTABULOUS! Thanks for sharing your recipes!!! On the ingredient photo, you show 4 bottles. However, in the ingredient list I only see 3 liquids: cola, rice wine & soy sauce. Is there another ingredient? Oh, there is a bottle of Korean corn syrup on the photo. It is an optional. It won't change anything except adding little shine on the dish. I must have forgotten writing it down. Thanks for pointing it out. I found your blog recently and am hooked! I am a Korean American with only basic cooking skills - I love your step by step pictures and just love how you are writing this blog for your kids. I literally just made this chicken dish tonight and am eating it now as I type this comment - it's SO good! Just like at Korean restaurants. Thank you for sharing your recipes - I've bookmarked your blog! Thank you SOOO much for posting this. I had some amazing cola Jjimdak in downtown Gunsan a couple years ago and I go back to that restaurant every time I am in South Korea. I was trying to find out how they made it and this is precisely what it was that made their Jjimdak different. I can now eat my favorite food in the states! Oh and just another note, I add Korean Rice Cakes to mine, they soak up the flavor so well and just add another texture to the dish. How wonderful to add some rice cakes in the dish? Brilliant! I made it tonight. Couldn't get the sauce to reduce. Still delish. Cola was the secret ingredient!!! I made this tonight n it taste wonderful!! Thx for sharing! I just discovered your blog and made this. Delicious. Hubby said it was better than the restraurant's dak chim he ordered last week. I'm an American living in Seoul, married to a Korean. That is so great, Tina. I am happy to hear that your husband liked it. Hope you get to try other recipes to make him happy again. Before, I made the Peri-Peri chicken (which I loved, btw). Now, I am in love with this recipe. 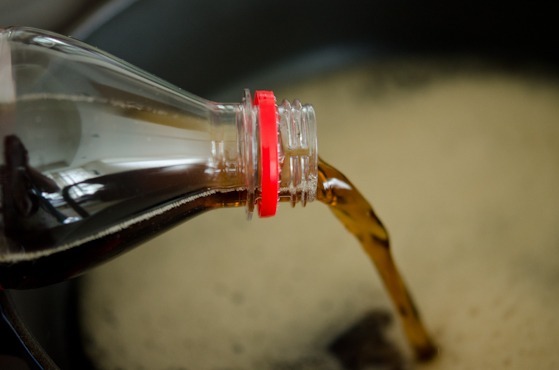 At first, I was a wee bit skepical--I was still unsure of using Coke in actual cooking. However, the moment I gave the sauce a taste--even before I added the chicken to braise--I became a true believer! I have made this dish at least four times, already, and I am nowhere near getting tired of it. Hi! All your recipes look amazing! I am not Korean but have some Korean friends that introduced me to this type of food and I love it! I'm so excited to try to make this dish! Question-- will this dish (especially the noodles) keep okay if I make it earlier in the day and then reheat it later, or does it need to be served immediately? I am not familiar with that type of noodle so I wasn't sure if it starts to dissolve after a few hours, or if it will keep it's shape. Thanks! Hi Michelle The sweet potato noodles last longer in the sauce retaining its texture and shape than other wheat based noodles. It should be fine for a couple of hours, but if you are thinking of making ahead, I would recommend to add when you reheat the dish. Soak the noodles in water overnight in the fridge and drain them, then add to the dish and cook until it is soft yet chewy. It only takes a few minutes to get done. Hope you enjoy the dish. It is really good, and I never met anyone who didn't like when I serve this chicken. For the cola braised korean chicken......you do keep the original water that you first put the chicken in and then removed?? I just can't tell if you toss that water when you remove the chicken. Thanks. 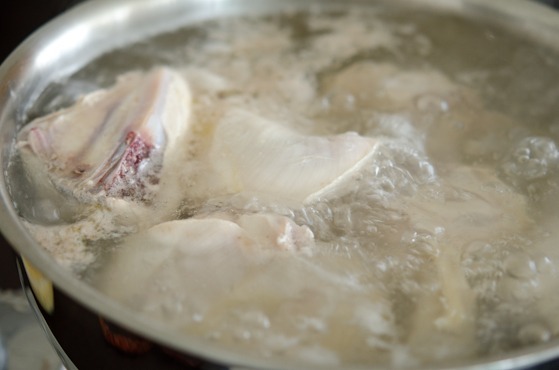 Hi, The water you first boil the chicken very short time should be discarded. This step is just to get rid of some fat and scums from the chicken. Thanks! This sounds delicious! I'm planning to make it this weekend, but I was wondering if there was a non-alcoholic substitute for the rice wine? My father is a recovered alcoholic and I am a little worried about feeding him something with alcohol in it. Thank you for the amazing recipe! You can leave it out and it will still taste great. How nice of you to be considerate about your father! Hope he likes it.